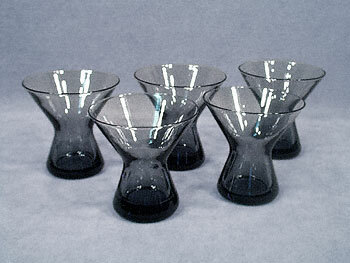 This set of five lovely hourglass-shaped bar glasses are made of sheer gray smoked glass. Standing 3" tall with a top diameter of 3", the significant weight and unique form combine for a remarkably comfortable fit in your hand. One of the glasses has a very tiny and nearly undetectable nick in its rim, but otherwise this terrific glassware set is in great condition.